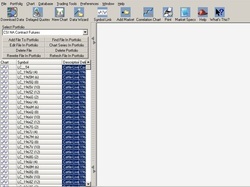 How to extract data with the Unfair Advantage History version? Install Unfair Advantage and type in your user ID and user Number. 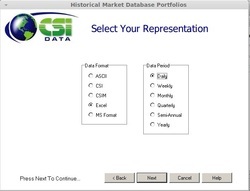 AFTER the first daily download you should receive the ‘Historical Market Database Portfolios’ window. 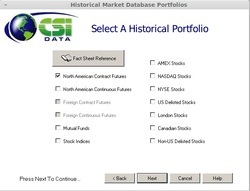 If you don’t receive the mentioned window, click PORTFOLIO and choose Historical Database Portfolios from the menu. Choose the package you subscribe to. 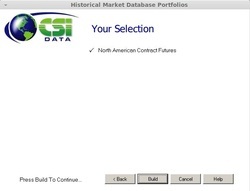 In this case we used the North American Futures. 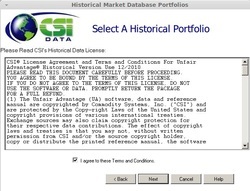 Choose the file format and data period. 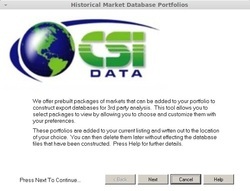 In this case we used the Excel file format and left the default setting for the data period. 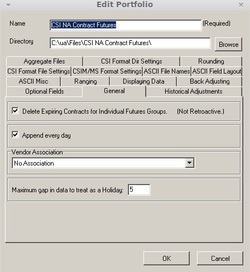 Unfair Advantage will start retrieving the files and after completion of the process it will ask you for the name and export folder. 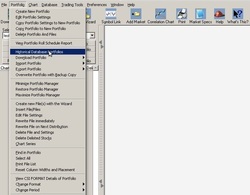 Type in a name for your portfolio. In this case we used the default name. Unfair Advantage starts writing the files to your hard drive. This process might take some time to finish. The export folder, if not changed, will be \ua\Files\.